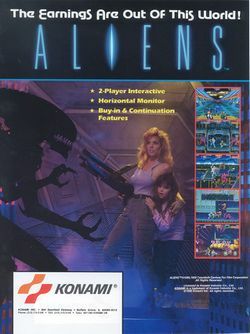 Aliens is a run-and-gun shoot 'em up arcade game by Konami released in 1990, based on the Aliens film. It picks up mid-movie with Lt. Ripley and Cpl. Hicks attempting to leave the alien-infested colony by making their way towards the drop ship, and notably takes some liberties with the film's storyline and the Aliens' biology. This page was last edited on 23 September 2012, at 01:18.